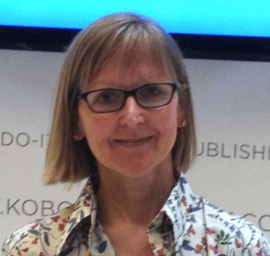 As a successful self-published children’s author I was delighted when Kobo invited me to give a talk on self-publishing at a course being run by Curtis Brown Creative on Writing for Children and Young Adults. The 15-strong class was mid-way through a part-time 12-week course run by UK children’s author Tony Bradman. Following on from me that day were (no less!) Francesca Simon, author of the Horrid Henry books and the UK’s newly appointed Children’s Laureate, Malorie Blackman. I felt honored to be billed alongside such incredible company! A slot on self-publishing on any creative writing course makes total sense now that this method of getting to market has come of age. For many aspiring authors, serious self-publishing offers a real (and in many cases more realistic) alternative to pursuing the traditional publishing route. In my case it has led to sales of almost 2,000 books in print and over 2,500 ebooks across my first two titles –The Secret Lake (Aug 2011) and Eeek! The Runaway Alien (Feb 2012). This is clearly not a JK Rowling story – however, the fact that my sales count in 1000s and print copies are stocked in the UK’s main bookstore, Watertones, is no mean feat: many children’s authors only sell books in the 100s! Publishing ‘too soon’ is the biggest mistake an author can make – yet extremely tempting and easy to do given the user-friendly upload interfaces offered by platforms such as Kobo, CreateSpace and KDP. Thankfully, the first time I took a copy of The Secret Lake into Waterstones, the manager there said to me: ‘Gosh, this doesn’t look self-published!’ My hard work had clearly paid off – and I felt proud! Just as serious self-publishing has grown, so has the range of freelance editors, designers, formatters, and assisted publishing services on offer. There are two main ways you can take advantage of these. Once ready, you then upload your files yourself to whichever platforms you are selling through. This is the approach I have used for both my print and ebooks. *If you are very confident using HTML or the finer aspects of Word then you could format your files yourself. Likewise, programs such as Scrivener has ePub conversion tools, and Kobo has just announced the facility to format your ebook within their dashboard. My own advice, however, is still to get help with formatting, unless you are certain you have the time and wherewithal to cope technically if/when things go wrong! There are a number of reputable companies that offer a range of services under one roof, from editorial review and line editing, to cover design to formatting – and right on through to upload, distribution and marketing. The cost of these services can reasonably run into the high £100s or low £1000s, but should never be extortionate. In some cases you can pick and choose the extent or level of service you want – but, importantly, you retain full rights to your work. Where do you start? In short, you need recommendations from people you trust. For this you can of course talk to authors you know or look on writer forums and blogs. I’d also recommend joining the Alliance of Independent Authors. This is a global not for profit organization for self-publishers, which offers regular advice on all aspects of self-publishing. Their book Choosing A Self-Publishing Service – The Indie Author’s Guide also contains recommendations and will be updated every 20 weeks. It also highlights companies or operations to avoid. Alas there is not room to go into detail here, but suffice it to say that once your book is out there the hard work starts. To find out specifically about marketing children’s books why not pop over to my blog and read my children’s books marketing tips. Karen Inglis lives in London, UK, and self-published her first children’s book The Secret Lake – a ‘time-slip’ mystery adventure for 8-11 year-olds – in September 2011. Her second book, ‘Eeek!‘ – about a runaway alien who loves soccer (!) – came out on 29 Feb 2012. She’s also recently released her first rhyming picture book – Ferdinand Fox’s Big Sleep. Check out her self-publishing blog, and her author blog. That’s great! Thanks for the advice as I have been debating recently which POD supplier to go with. As you are UK based it helps to get your perspective. Thanks again.